DESMI Boom | oil spill boom – SOS Safety International Inc. 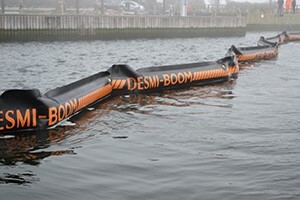 The DESMI BOOM is an oil containment boom especially developed for the containment of oil floating on the surface of water. It is suitable in a wide range of environments and conditions and is very easy is to clean, maintain and repair. 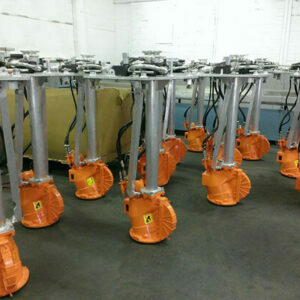 Deployment is very rapid using our high capacity air blowers. The Nitrile synthetic rubber DESMI BOOM is an inflatable boom. The construction of the boom is durable to withstand repeated deployment and training exercises. The boom is fitted with hot galvanized ballast/tension chain, has individual air chambers, each equipped with the standard Ro-Boom built-in non return valve. On request, fiberglass rod stiffeners are provided as an option to achieve max draft at all time. A wire connects the external chain to the boom. The DESMI BOOM is easy to clean after use. When it is deployed again after cleaning no residual oil is left to contaminate the sea, which will be the case for booms with chain in a pocket. 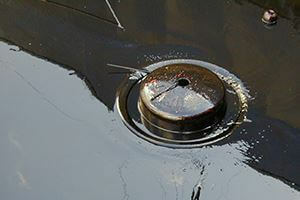 In addition, the external chain avoids chain pocket damage by the chain when dragged over vessel deck, Key side or Jetty. 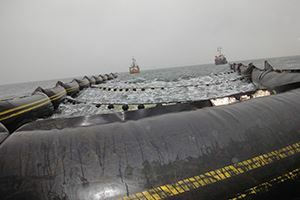 During sweeping operation, the ballast chain, which is slightly shorter than the length of the inflated boom, keeps the boom under constant tension, which maintains the best possible shape at all time. 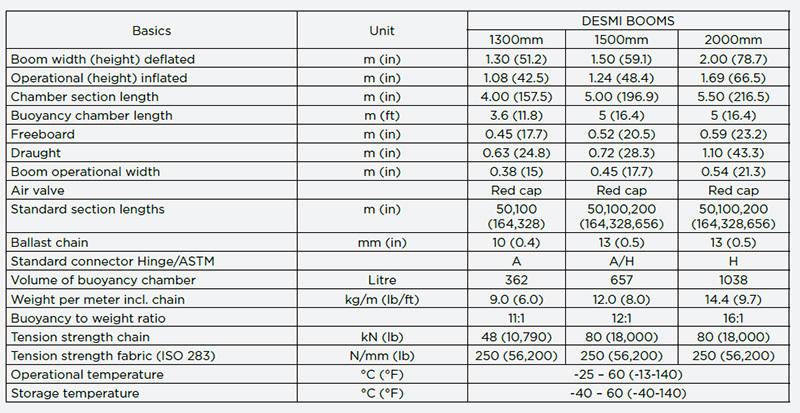 Proven technology in terms of oil resistance and excellent mechanical properties. Individual air chambers for reliability and security. Designed with a high buoyancy to weight ratio, providing the boom with excellent wave riding and oil retention characteristics. External chain to allow 100% cleaning of boom, ideal shape during operation and protection against damage to the boom.